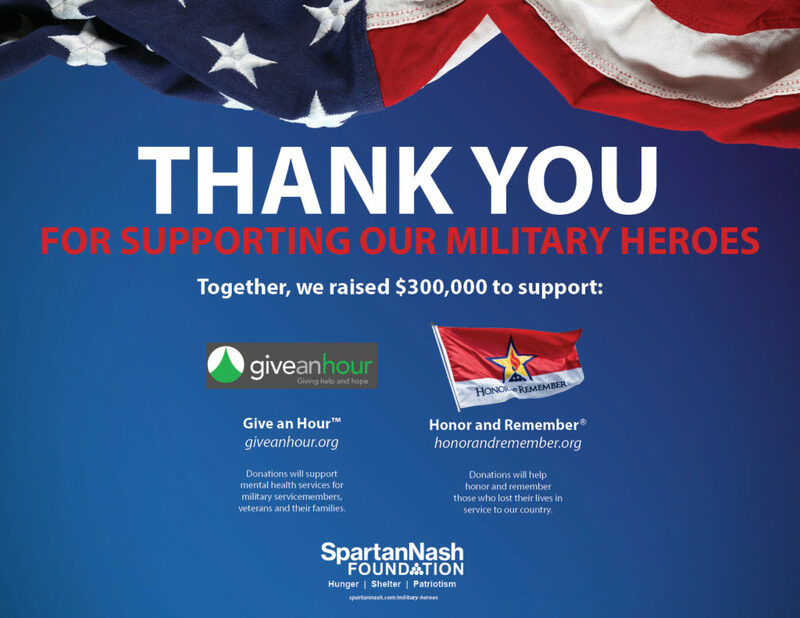 GRAND RAPIDS, Mich. – Together with its store guests and company associates, the SpartanNash Foundation’s scan campaign to support military heroes and their families was its most successful companywide retail fundraising effort to date – raising $300,000 on behalf of Give an Hour™ and Honor and Remember®. During the 12-day scan, store guests who visited any participating SpartanNash-owned retail store or fuel center in nine states had the opportunity to donate $1, $5 or $10 at any checkout lane, with 100 percent of dollars raised split evenly between the two nonprofit partner organizations. The $150,000 that will be donated to Honor and Remember will allow the organization to provide outreach and personalized Honor and Remember flags to families of military heroes who paid the ultimate sacrifice in service to our country. Personalized Honor and Remember flags are regularly presented to families of fallen service members and contain the name, theater of operation and date of death of the individual. The flags are presented at both private and public occasions. The $150,000 donation will enable Give an Hour to increase counseling and mental health services to our military heroes, their families and communities affected by conflict abroad. In addition to pledging to “give an hour” of their time each week for direct counselling, Give an Hour’s network of volunteer professionals are working to reduce the culture of mental health by participating in and leading education, training and outreach efforts in schools, communities and military bases so that all in need are able to seek and receive the care they deserve. Give an Hour is a nonprofit 501(c)(3) that develops national networks of volunteers to respond to acute needs within our society, beginning with the mental health needs of military servicemembers and their loved ones affected by their time of service. Give an Hour’s network of volunteers includes nearly 7,000 licensed mental health professionals across the nation, encompassing all 50 states, D.C., Puerto Rico and Guam. To date, Give an Hour providers have donated nearly 225,000 hours of free counselling and mental health services to military personnel, their loved ones and hometown communities affected by conflicts abroad. The mission of Honor and Remember is to perpetually recognize the sacrifice of America’s military fallen heroes and their families. The organization pays tribute to all military lives lost, not only while serving on active duty but also as a result of serving, including PTSD. Military deaths in all wars or conflicts and all branches of service from our nation’s inception are recognized. The primary vehicle for perpetual recognition is a specific and dedicated symbol of remembrance: The Honor and Remember flag, which is intended to fly continuously as a tangible and visible reminder to all Americans of the lives lost in defense of our national freedoms and as a statement of appreciation to all fallen military families. SpartanNash is a national partner and strong supporter of Honor and Remember, underwriting personal flag presentations to families of the fallen and flying the Honor and Remember flag at all company facilities. The flag artwork is also displayed on SpartanNash’s fleet of tractor trailers, which travel more than 55 million miles per year. To learn more about the companywide fundraising effort and the organizations it supported, visit spartannash.com/military-heroes. “Each year, SpartanNash contributes thousands of dollars, products and volunteer hours to military and veterans organizations and events, and we are proud to have teamed up with Give an Hour, Honor and Remember and our store guests to support our military heroes in this unique and powerful way,” Gremel said. In 2016, the SpartanNash Foundation launched its first-ever companywide fundraising campaign to support its patriotic nonprofit partners. The scan and Foundation contribution raised $182,000 to support our military heroes. So far in 2017, the SpartanNash Foundation has executed retail scan campaigns to support local Special Olympics, Habitat for Humanity and patriotic partners in the communities it serves. To date, nearly $785,000 has been raised through the generosity of its store guests and funds contributed by SpartanNash and the SpartanNash Foundation.